So confident in their run of successful summer musicals is Chichester Festival Theatre that the transfer for Kiss Me, Kate (it will play at co-producers London’s Old Vic from 20th November to 2nd March) was announced before it had even opened at its native theatre. But with experienced hands Trevor Nunn directing and Stephen Mears choreographing, Cole Porter’s ever-spry music and a cast headed up by leading light of the British musical theatre scene Hannah Waddingham, it was a reasonably safe bet. And unsurprisingly, it is one that has paid off. The show follows a theatre company putting on a musical version of Shakespeare’s The Taming of the Shrew, where the feisty relationship between Petruchio and Katherine is echoed by the conflict between director and leading man Fred and his ex-wife Lilli who is playing opposite him. As the offstage drama threatens to overwhelm the onstage, some shenanigans from another member of the company in a gambling room throws matters further into disarray. Sam and Bella Spewack’s book intertwines the Bard’s plot with that of their own invention but though there’s a neat dovetailing, the story lacks a genuinely engaging heart, the emotional charge that would keep us thoroughly invested. Instead, it is Cole Porter’s vibrant music (including such classics as ‘So in Love’ and ‘I’m Always True To You (In My Fashion)’ and witty lyrics – a whole song rhymed around Bianca… – that grabs the attention, especially in the sparklingly fresh musical arrangements by Gareth Valentine. Nunn’s production suffers from a similar dichotomy: outside of the musical numbers, it has a rather languid feel, stretching out to three hours, and consequently contains too little of the sharpness it needs to make the heart beat faster or for the comedy really bite. Mears’ choreography is extremely elegant, though perhaps lacking a little fresh imagination and sometimes adds to a pace which could skip a little faster throughout. It is of course excellently performed though. Alex Bourne brings an effective swagger to the garrulous Fred, determined that the show must go on, but the evening belongs to Hannah Waddingham. Vocally dextrous and clear as a crystalline bell, she oozes star quality and the requisite Hollywood glamour as Lilli, but ultimately theirs is never a romance that the show never really gets 100% behind, there’s little sense of the gravity of the decisions being made – instead things just happen. Samuel Holmes and Kevin Brewis match up well with Adam Garcia as Bianca’s suitors – Holly Dale Spencer gives a cracking turn, though Garcia comes into his own with every effortlessly flawless dance move he makes; there’s some luxury casting with Clive Rowe and David Burt as a pair of cartoonish gangsters given to a vaudeville turn; and Jason Pennycooke leads the ensemble in a thrilling opening to Act 2 to the tune of ‘Too Darn Hot’. With the bar having been set so very high by last summer’s musical successes – Singin’ in the Rain and Sweeney Todd – it is hard not to feel just a little disappointed that Kiss Me, Kate doesn’t quite meet that superlative standard. What we have though is still highly enjoyable and a pleasure to watch. 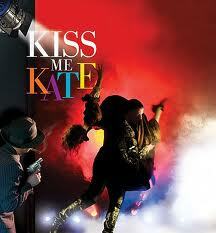 Nice review: agree that Adam Garcia dances like a dream. He must bathe in the blood of virgins too, hardly seems to have aged a day! Your review hits the nail on the head. I had a feeling when watching it that this show is designed for the Old Vic stage and not for the Festival Theatre- very little use made of the auditorium entrances for example. With the exception of Hannah Waddingham, it all lacks bite, and there is often a sense that the cast are trying too hard to reach the full comic potential. And while I thought David Burt was spot on as one of the hoodlums, it seemed to me that Clive Rowe was not quite right for this double act: "Brush Up Your Shakespeare" should be a showstopper, and it wasn't in this production. But you are right- after the musical successes of the last two seasons at Chichester, the bar has been raised substantially, and this did not make it.